Cutting edge model from the Predator range, the 108 is an unmistakable Sunseeker super-yacht. Its design recalls the classic stylistic elements that have made this boatyard famous all over the world; its waterlines, then, contribute to comfort when sailing, a quality of every craft produced by this English yard. Deck configuration leaves nothing to chance. The main deck is available in two layouts, which differ in several details regarding the cockpit and saloon. 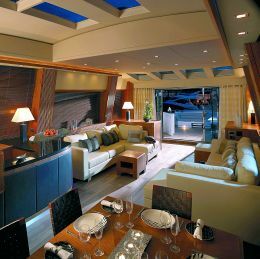 In the first case the cockpit houses a central dinette with table and perimeter seating and a sundeck astern, while the alternative version has this outside area used for a dining/relaxation zone to port with a galley/bar corner opposite. Regardless of the layout chosen, in the bows we have a Jacuzzi surrounded by numerous sunbathing cushions. There are no great differences in the internal layout between the two configurations and in both we have a saloon astern, galley, dining area and control bridge. The Predator 108 also has an electric sliding Hard Top, nowadays a trend followed for most Open Yachts, meaning that it only takes a few seconds to turn the area inside the deckhouse into a cool, sunny zone. There are two layouts proposed for the lower deck, with the owner's suite located amidships, to make the most of the boat's full beam. This has an en-suite bathroom, office corner, relaxation corner and walk-in wardrobe. Forwards of this there is a small leisure zone comprising a sofa to starboard and an office corner to port, area that in the alternative configuration is "incorporated" into the owner's suite, which also enjoys a larger dressing room and bathroom with tub instead of shower. With both versions guests have two twin cabins and a Vip cabin at their disposal in the far bows. The crew's quarters are in the stern area with two bunks, a bathroom and galley. The Predator 108 is available either with a couple of MTUs with ducted propeller transmission, for an official maximum speed of 32 knots or with triple MTU motorization with Arneson surface transmission, enabling an official maximum speed of 42 knots. 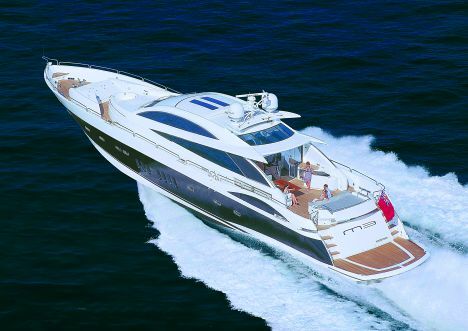 For further information: Sunseeker Italy-Cantiere Navale C&C; via dei Devoto 151/153 Box 6B; 16033 Lavagna (GE); tel. +39 0185 59021; fax +39 0185 307322; website www.sunseeker-italia.it. Maximum speed: 32 knots; 42 knots.